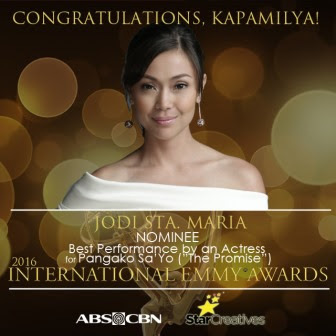 ABS-CBN Corporation once again received honors from the International Emmy® Awards as Kapamilya actress Jodi Sta. Maria and ABS-CBN teleserye “Bridges of Love” picked up nominations at this year’s prestigious competition. Jodi was recognized for her outstanding performance as Amor Powers in the 2015 remake of “Pangako Sa ‘Yo” and is nominated in the Best Performance by an Actress category against Judi Dench (United Kingdom), Grazi Massafera (Brazil), and Christiane Paul (Germany). 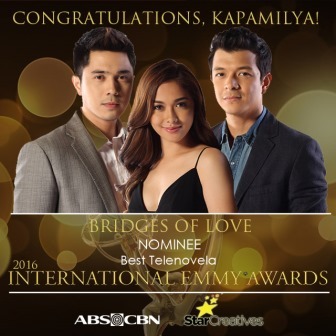 “Bridges of Love,” meanwhile, will be competing in the Best Telenovela category alongside telenovelas from Canada and Brazil. The series shares the tale of two brothers, Gael (Jericho Rosales) and Carlos (Paulo Avelino), who were bound by their promise to each other, separated by an unfortunate tragedy, and bridged together by love embodied by only one woman — the vivacious club dancer Mia (Maja Salvador). “Bridges of Love” was the first Filipino series to air in the Latin American region, particularly in Peru via PanAmericana. It is followed by “Pangako Sa’yo,” which is currently airing in the said Peruvian TV channel. Aside from Peru, both series already aired in different countries in Asia and Africa. Jodi and “Bridges of Love” are the only nominees that come from the Philippines among the 40 nominees across ten categories and 15 countries in this year’s awards. Last year, ABS-CBN chief content officer Charo Santos-Concio was chosen as the Gala Chair for the 43rd International Emmy® Awards and opened the gala before the world’s best producers, creatives, and talents. She is the first Filipino Gala Chair invited to participate in the prestigious event. ABS-CBN previously scored International Emmy® Awards nominations for “Precious Hearts Romances Presents: Impostor” (Best Telenovela) in 2011, “Dahil May Isang Ikaw” (Best Telenovela) and Sid Lucero in “Dahil May Isang Ikaw” (Best Actor) in 2010, and “Kahit Isang Saglit” (Best Telenovela) and Angel Locsin in “Lobo” (Best Actress) in 2009. This year’s winners will be announced at a black-tie ceremony on November 21 at the Hilton New York Hotel. The International Emmy® Awards are given by the International Academy of Television Arts & Sciences.